Three Fridays ago, scrottie and I did a 45-mile Friday night ride we refer to as "Around the World", which loops north through Scottsdale up to Fountain Hills, then back again. Last weekend, we rode up to Paradise Valley, and on the ride there, had a disagreement about proper cadences and cycling methodology. As a result, this past Friday, I wound up going out to ride the 75-mile "Around the Universe" variant on my own. This won't matter much to most readers who don't know the area, but the 75-mile version was WAY more pleasant than the 45-mile version. The 45-mile version involves an uphill climb on Shea Blvd, which is a major arterial and lacks bicycling amenities along a key uphill segment. As we were riding along, some dude in a convertible saw fit to try and deliver a lecture on cycling safety to us from the next lane over, which didn't help matters ("Do you have ANY idea of what you're doing?!" Um, yes, dude, yes, we do.). To top that off, the 45-mile version put us back onto Highway 87 at around 10 pm, a time of night when there is still a lot of traffic. In contrast, the Around the World route avoids Shea by going up and over Dynamite Blvd instead. Sure, it's more climbing, but I just shifted down and worked my way up at a moderate pace. After the descent down Dynamite, the whole section along McDowell Mountain Park was quiet and wonderful, and there were some sections with refreshing pockets of cool air. And by the time I got all the way back down to Highway 87, it was late enough that traffic had really quieted down. I don't know if I'll wind up building all the way back up to the full Midnight Century or not, because the full thing takes that much more time, late at night, and I'd like to hold on to some semblance of a normal sleep schedule. But the Around the Universe was really nice and it felt good to lay down some miles. 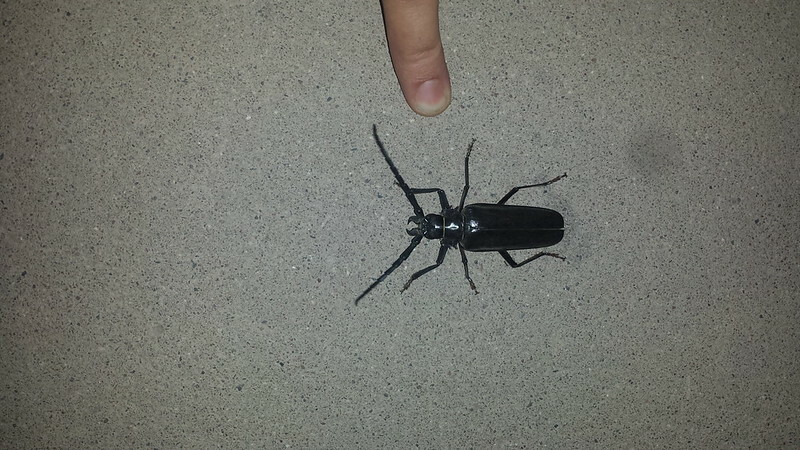 I saw a palo verde beetle on the bike path towards the beginning of the ride. They are so cool. Both ceramics sessions this week were fairly uneventful. Mud therapy. 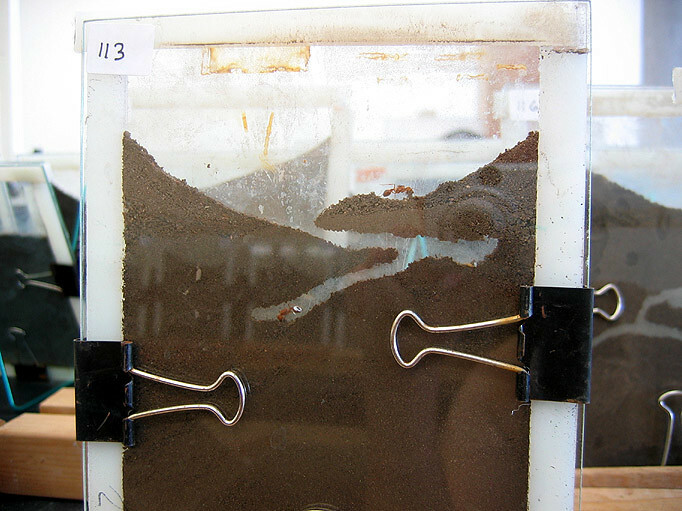 The two queens in this photo are excavating: digging up soil, carrying it to the surface in their chin-whisker beards, and depositing it there. Okay, only ~150 nests at the moment. I went in to help for 2 hours on Saturday, but am trying to avoid getting sucked in too much. Not my project. You can just barely see the tops of the palm trees along Palm Walk. The tallest building in the background is the Life Sciences E wing. 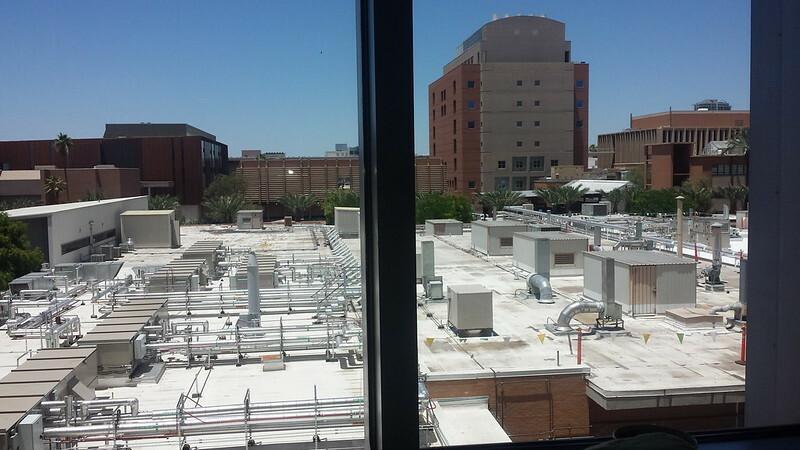 The stuff in the foreground is the top of some engineering buildings. I originally thought I'd be spending most of today hanging out with my cousin A, but then she had a change of plans. Unexpected free day got devoted to: baking pumpkin scones, lemon-ricotta muffins, and bread; vacuuming like woah*; a whole series of minor bike tweaks**; and various other odds and ends. Then S and I booked the moving truck for the Great Crazy American Cross-Country Junk-Hauling Expedition. By the dubs - it cost $50 for S to join AAA, and that knocked $500 off the truck rental price (=net $450 savings). *I don't think I've mentioned too recently that I hate carpeting. I hate carpeting. Also, Arizona is so dusty that I had to empty out the (bagless) vacuum like 12 times while vacuuming this 800-square-foot place. Yes, literally, 12 times. **Froinlavin got 2 new hot pink bottle cages and is now all matchy-matchy with the black and hot pink aesthetic. The Jolly Roger got a 1.5" rear tire to replace the 1.75" one, a swapped bottle cage to replace one I decided I didn't like (annoying design), some much-needed basket repair work, and new festive basket lights for night riding. This entry was originally posted at https://rebeccmeister.dreamwidth.org/1233952.html. Please comment there using OpenID.